Though she doesn’t know her name, Thirteen is sure of two things: survival and finding her sister. 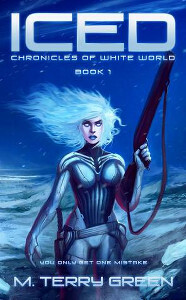 Nothing stands in her way—not the great Pacifica Ice Sheet nor the slavers she escaped—until her deadly hunt takes a maddening turn. The first and only clue in her search is held by the survivor of a wrecked ice ship. But he’s not sharing. He has a daughter to rescue, and he needs Thirteen’s help. In the unforgiving subzero, a wary alliance is formed. Although she’d do anything to find her sister and finally know her own name, Thirteen never forgets the first rule of the ice. You only get one mistake—your last. Sometimes there are books that draw you in from the very first paragraph and don’t let you go until the end, and Iced is indeed one of them. The world depicted here is our world, our Earth, but dramatically altered by some climate change that has transformed it into a ball of ice: no reason is given and yet that hardly matters – whatever happened in the past is unimportant. The focus here is on the aftermath, and the way people have adapted to this radically different – and merciless – world. People either live in protected cities near volcanoes, drawing heat and energy from the fiery lava boiling underneath, or they move around on the ice in “boats” that use the strong winds as a propulsion force and as a source of power. In such a situation, preying on each other becomes the norm: people either trust the relative safety of a convoy or brave it alone, while slaver crews target the defenseless to supply fresh manpower to city dwellers and the feared Skulls swoop down on everyone to wreak bloody havoc. Thirteen is one of the loners, and a very peculiar one: that’s not even her name, but just the last two digits of the identification code tattooed on any slave’s back. She hunts for slavers, drawing them in with her unthreatening looks and killing them, in her dogged pursuit for her sister’s whereabouts: that’s how she gained the name of “Ghost”, spoken with hatred by the slavers and whispered in hopeful awe by the exploited. Thirteen is unusual in many ways, appearance being the foremost: frosty hair and eyes, the latter sporting a nictitating membrane, she can blend quite easily into the colorless surroundings in a land where this ability enhances one’s chances for survival. She’s also a cypher, even to herself: it’s quite clear that some parts of her past have been erased – or maybe she chose to forget them – and that pain and anguish have damaged her both in body and spirit, yet she’s a fighter and a survivor, not at all inclined to give in to whatever fate deals her. Readers get to know Thirteen – as much as the story allows it – in small increments: she does not speak much and even that little is measured out with enormous reluctance, as Cord will learn the hard way. He’s the other driving force of this story: a father desperate to find his daughter, abducted by slavers – that’s how he looks on the surface. Yet there are many untapped depths in Cord, not unlike Thirteen, and the tantalizing indications of an interesting past: his basic honesty and integrity play quite well against Thirteen’s wariness, making their alliance a fascinating, if complicated, one. Through Cord, and his recollections of happier times with his daughter Miyu, we also catch glimpses of everyday life in the ice-treading caravans. Glimpses is also what we get of the way the more fortunate live: the city of Helado, built around a volcano, offers all the creature comforts one could want in that desolate landscape – warmth, food, shelter – but it’s also a place of danger and intrigue, where prince Céfiro, a cold-blooded, psychopathic killer, schemes against the king his father to gain the power he thirsts for. And what about the prophets? A cross between ministers and scientist, they look like the real power behind the throne and the hidden movers and shakers of the world. These are all compelling hints of a broader story that sees its starting point in this book: that’s what drew me in from the beginning and kept me glued to the pages until the end – an end that left me suspended in mid-air as if over one of the many ice crevasses peppering the landscape. If I wanted to find a negative side in Iced it would be its brevity: it’s over far too soon, and it leaves you with a great amount of frustrated curiosity and too many unanswered questions – and I want to make it clear I consider this a compliment. The sheer believability of this world, the compelling nature of the characters, put their hooks into my imagination, and they will not let go until I know more about them. To me, that’s the mark of a good, solid story. To say I’m looking forward to the rest of it, would be a massive understatement. I received this book through NetGalley, in exchange for an honest review. 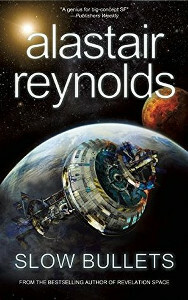 My thanks to both NetGalley and Tachyon Publications for granting my request, since Alastair Reynolds is one of my favorite SF authors. Slow Bullets is slightly different from the kind of narrative I grew used to after reading Reynolds’ books like Chasm City, Revelation Space, Redemption Ark or Absolution Gap: the scope here does not concern galactic civilizations or multi-layered political plots, but rather focuses on smaller-scale events that nonetheless manage to gain intensity and depth because of that reduced focus, and not in spite of it. The main character here is Scur, a soldier who’s been conscripted to fight in a bloody war: when we first see her, a ceasefire has just been declared and yet she’s captured by the enemy and subjected to torture by Orvin, an infamous psychopathic killer from the opposite side. Left for dead, she wakes up in a hibernation pod on a ship that’s undergone some form of catastrophic malfunction and is now orbiting what looks like a dead system. The great majority of the slowly waking occupants of the hibernation pods seems to be composed of soldiers from both sides of the war, plus a smattering of civilians, and a skeleton crew: Scur takes on, almost by default, the job of organizing the survivors and finding out their chances of repairing the ship and trying to get back to their intended destination. The questions about what happened and the need for survival, this last endangered by far-reaching frictions between the waking passengers, are compounded by the awareness that the ship is slowly, but surely, losing precious information because of a program rewriting initiated by the malfunction itself. And memory is indeed at the core of this story, starting with the titular slow bullets – a recording device implanted in soldiers to keep score of their actions and also to store important memories and personal data. The fact that Scur’s torture at the hands of Orvin occurs through the twisted use of a slow bullet underlines how memory can be painful as well as a comfort. So, as the marooned passengers slowly understand that their predicament could not be purely ascribed to an accident, as they realize their numbers are mostly composed by people no one wants around – because they are useless, or dangerous, or simply a burden – they also recognize that only by letting go of their personal memories, of their past, they can start planning for the future. It’s a terrible, sad realization, placed into stark relief by Scur’s attachment to her parents’ pictures, stored in her slow bullet – her only contact with them, with her past and the person she was before the war and her conscription in the army. What she and the other survivors must accept the terrible necessity to give up that past to be able to build a future: even though the hope for that future is clearly expressed in the story, the price it requires seems too high, too heartrending. All this is presented through Scur’s voice and point of view: her almost blunt, soldierly manner cracks at times to show a different person, one far less pragmatic and hardened than the one she shows to the world, and these chinks in her armor endeared her to me, made her real. Underneath the soldier, and survivor of a heated conflict, sometimes lurks a person who pines for her lost life, the missed opportunities, the untrodden paths that fate denied her: it’s never openly stated, never spoken out loud, but it’s there and it’s a form of quiet desperation that denies detachment and does not leave you untouched. It’s a more intimate vision than what I encountered until now in Reynolds’ books, but for this very reason it felt more profound and poignant than any other I read so far, and it gave me a new level of interpretation for this author, and a key to a new way of reading his stories. Highly recommended, both for Reynolds’ admirers and as an introduction to this author. 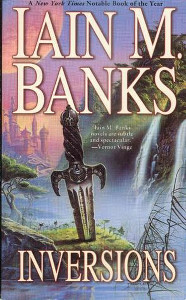 One of the most fascinating aspects of this book is that it can be read on different levels: for someone not accustomed to Iain Banks’ writing it might appear like a fantasy novel, set in a medieval-like world replete with court intrigue and political games, plotting nobles and selfless heroes, and it can be read as such with no loss or lack of understanding; but for those who have already encountered the Culture, the star-spanning civilization at the center of Banks’ stories, it’s quite another matter. The novel deploys on two different tracks: one follows Doctor Vosill, personal physician to the king of Haspide, and is narrated by her apprentice Oelph in the form of letters/reports to his mysterious “Master”, someone who has placed the young man alongside the doctor with the task of spying on her; the other one, told instead in the third person, concerns DeWar, the bodyguard of the Protector of Tassasen, a realm on the other side of the world from Haspide. Vosill faces quite some challenges, first because she’s a woman in a profession traditionally held by men, and second because she voices medical theories that are quite advanced for Haspide and are therefore looked on with suspicion and scorn by her peers. The fact that she has gained the favor and the trust of the King does not help her, either. DeWar’s position is far easier, of course, even taking into account the constant threats to the Protector’s safety, that he tackles with such unflagging vigilance as to be the object of constant jests, even from his own high-placed charge. Unusual narrative arrangements are not new to Banks (Use of Weapons comes to mind) and this keeps the story-flow quick and engrossing, particularly when some peculiar details come to the fore and become instantly recognizable to a Banks aficionado: Doctor Vosill’s medical treatments and her approach to medicine speak clearly of a more advanced civilization, attributed in the story to her origins in distant Drezen but easily pointing to a quite different and more sophisticated source. On the other side of the world, DeWar tells the Protector’s young son some fascinating stories about the imaginary land of Lavishia, where people enjoy a carefree and easy life in pursuit of knowledge and enlightenment. When he relates the tale of two friends, Hiliti and Sechrom, who differ in outlook about the best way to bring Lavishia’s life-style to other less fortunate people, the proverbial cat jumps out of the bag, since the two approaches – just observing without intervening versus nudging forward, more or less forcefully, other cultures’ evolution– show quite plainly the dichotomy at the basis of Banks’ Culture novels, and the philosophies of Contact and Special Circumstances. But even without these details at one’s disposal, the story is absolutely enjoyable, and one could read it simply as the journey of two different people who never meet but care deeply about the outcome of their respective adoptive societies. Vosill and DeWar are indeed mirror opposites – inversions – and the novel deals more with the shaping and development of their characters rather than with the events they are at the center of or the world they are visiting, while approaching the main question: is it better to let a culture move along its evolutionary path undisturbed, or to guide it, unobtrusively but firmly, toward a better one? And who can decide what is better, or if the price to be paid (because there is always one) is worth the outcome? More important still: where is the border that separates constructive help from high-handed interference? Because both characters do interfere, apparently in small ways, in their respective societies, but neither of them can predict the long-term consequences of their actions: stopping a deadly plague can have the immediate effect of bettering the living conditions of a city’s inhabitants, for example, but no one can tell whether one or more of those who might otherwise have died would impact the future of that city for good or bad. And even DeWar, who appears to be the one who prefers observation to intervention, does change the possible outcomes by saving – repeatedly – the Protector’s life: who can tell if that’s a good or a bad thing? If there is no easy answer to the question – as I think there can’t be, because the matter is too subjective and too subject to unforeseeable variables – the merit of the book goes to the story itself and to the characters: DeWar appealed to me a little less, probably because of his quiet and unassuming ways, while I enjoyed reading about Doctor Vosill’s adventures quite a bit. Her interactions with young Oelph, her attempts at making him a thinking person, one who is not guided by preconceived notions and set standards, are conducted with fine humor and a clear affection for her apprentice. Where she truly shines, however, is in the wordplay with King Quience and his courtiers, especially those who make no mystery of their distrust and scorn: there is a definite flavor of danger in such exchanges, of complicated dances over a blade’s edge, with the doctor being quite aware of the pitfalls awaiting her in case of a miscalculation and yet appearing to enjoy her play with fire. The two stories, Vosill’s and DeWar’s, are somewhat wrapped up but not in a definite way: it’s something I have become accustomed to with Banks, who always leaves a sort of open ending to his books. It can be frustrating at times, but after a while I’ve come to appreciate this side of his story-telling: in a way, stories never end – when we close a book, the characters ideally go on with their lives, move toward new discoveries, and so on. This world where these two characters have spent some time has changed – for good, or for bad, we are not given to know, but change has come, partly through their passage in its history. Have they done some good, or not? That remains an open question, of course, but they both fascinated me while I followed their journey. And it’s more than enough. If you know of a plant that is either not on earth, or doesn’t act the same way in fantasyland as it does on earth, then you can consider it unique. Triffids: From John Wyndham’s Day of the Triffids novel, they are carnivorous plants able to move that take advantage of humanity after a weird meteor shower has left most of the population blind. 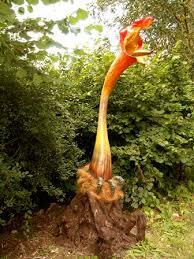 Triffids can literally uproot themselves and walk on three stumpy “legs”, while the long, whiplike stem ends in a poisonous stinger, the Triffid’s means of attacking hapless humans. 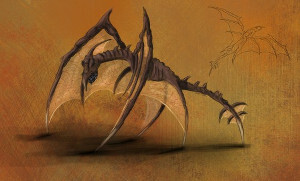 Inkvine: a creeping plant found in Frank Herbert’s Dune universe. 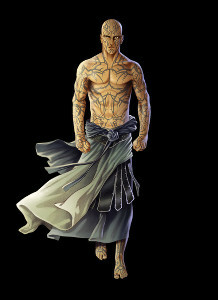 Native to Giedi Prime, the home planet of House Harkonnen, it is used as a whip to subdue the slaves: the victims of an inkvine lash are marked by dark red “tattoos” that cause pain for years on end. Gurney Halleck, the master of arms of House Atreides and young Paul’s instructor, bears such a mark on his face from the time he was held captive in the Harkonnens’ slave pits. 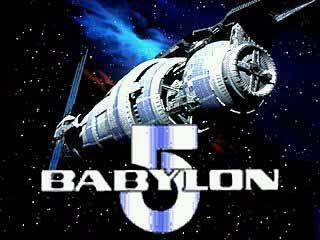 G’Quan Eth: in the Babylon5 universe i’ts a plant indigenous to the Narn homeworld, and it’s used in Narn religious ceremonies where it’s burned as we would incense. Since it’s difficult to grow and quite delicate, it requires costly measures to transport, but it’s also very prized by the Centauri who drop its seeds in alcohol to obtain a powerful narcotic. For this reason, it’s been declared illegal on the Babylon 5 station, except when used for religious purposes. Ents: it would be impossible to talk about special plants without mentioning these creatures, from JRR Tolkien’s Lord of the Rings. They are tree-like creatures able to move and talk, gifted with immense strength and said to be the most ancient race in Middle Earth. Their role is to be shepherd to the trees and protectors of the forests, and their most famous representative is Treebeard, who plays an important role in the War of the Ring. According to GRR Martin’s A song of Ice and Fire, in the North of Westeros you can find Heart Trees: usually placed at the center of a Godswood (a secluded place of religious worship), they are white-barked, red leaved Weirwood trees with a face carved in the wood of the trunk. These trees’ sap is red as well, and flows from the cuts that represent the face’s eyes, so that it’s said the Heart Trees are weeping tears of blood. And last but by no means least, a recent encounter: Groot. 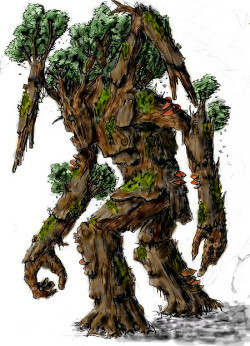 He’s an alien, tree-like creature not unlike Tolkien’s Treebeard, who made his first appearance in the Marvel comics and then received world-wide acclaim in the movie Guardians of the Galaxy. 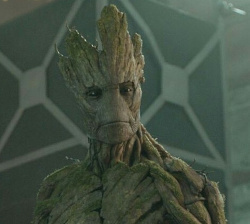 He appears at first as nothing more than hired muscle, but soon shows his softer, gentler side and is able to convey a great deal of meaning with the only sentence he ever utters: “I am Groot”. It’s impossible not to feel a great kinship for this creature because, after all… we are all Groot! Having greatly enjoyed the first book of the White Dragon Black series, I was thrilled when the author contacted me to read and review this short story collection: in my blog post about Tomorrow Wendell I wrote about the many shadowed corners of this world I would have liked to explore, and this looked like the perfect opportunity to do so. The tone of this collection starts in a somewhat lighter note than the first novel, at least judging by the Q&A interview with Jonathan Alvey himself: a fun, irreverent exchange of sentences that had me laughing out loud in many places. Given the darker mood of Tomorrow Wendell, this was a welcome change of pace, even though I later discovered that the vein of the individual stories goes from the light and humorous to the darkly dramatic, with many in-between nuances touching on different subjects like voodoo and message-delivering zombies or haunted houses hiding dangerous secrets. 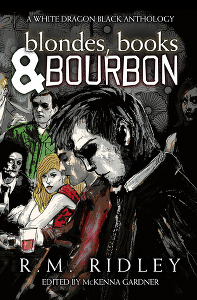 The first story has a marked noir feel, with Alvey’s narrative recalling the voice-overs of genre movies and the arrival of a darkly alluring lady with a mysterious agenda completing the picture: this tale does not lack humor, though, and carries on in the playful tone of the introductory interview, leaving some threads hanging for what might be a continuation of the events in the future. The illusion of lightness does not last long, though, since the second tale veers in a different direction, starting with a distraught and weeping father and continuing with a kidnapped child. There is no room for fun in a story where ghouls and blood are involved and in this one I had to re-assess my vision of the city of New Hades, especially in the description of the worst part of town where Alvey and the kidnapped child’s father go to retrieve the little girl: “where [..] dead men eked out a life stealing the dreams washed into the gutters (…) There, you stop to taunt death or dump the body”. That’s when I realized that not even the better parts of New Hades are left untouched by the darkness that lurks in every corner, from the evil glimpsed in the periphery of one’s vision: they might look cleaner, more ordered and peaceful, but they are not safe. New Hades is both fascinating and scary, and I keep picturing it in my mind as a black and white background (again the comparison with noir movies from the ‘40s comes to the fore), a place where the days are short and nights last longer, a place where rain falls harder and the cold seeps right through your bones. What’s interesting is the way that magic has infiltrated the very fabric of the city, popping up in the most unlikely places, as it happens in one of the stories where a powerfully dangerous grimoire appears in the public library: that’s what makes New Hades so fascinating, because the events that involve Alvey and his clients give the city a Twilight-Zone-like quality that makes it unique. Yet it’s in this kind of circumstance that Jonathan Alvey shines through, with his determination to save the innocents and those who can’t defend themselves, with his willingness to pay any price, no matter how steep, to succeed in his mission. That’s what made me like him in the first book and what reinforced that feeling in this one. Jonathan Alvey is indeed a peculiar character wearing an outer shell of cynicism that hides his true nature: he’s more similar to the proverbial knight in shining armor than to the scruffy, heavily drinking and smoking individual the world sees. The price he pays for practicing magic is a costly one – addiction in the truest sense of the world, and a slow but certain erosion of his life force – but he’s prepared to pay it if it means keeping the world safe from the terrible things most people are unable to perceive or see. At some point, someone asks him: “You really think you can save the world?”, to which Alvey replies: “No—just one person a day.” This is indeed Alvey in a nutshell – a person whose measure is given not by what meets the eye, but by the profound respect and care he enjoys from those he has befriended or helped. These people are the mirror that reflects the right image, the truest nature of this peculiar man. I will certainly welcome more from this background and this character.